Innumerable speeches have been given on the subject of humanitarianism and the need to care for refugees. These powerful addresses have underlined how the global population is one big family whose members share a common destiny, with humanity being unable to advance its culture and civilisation unless it truly believes in these values. However, few of these speeches are turned into practical actions that face down persecution, challenge oppression and alleviate the suffering of displaced peoples around the world. Today, the plight of Rohingya Muslims is putting our humanitarian responsibilities to the test, despite these values having been shared by most of the world’s countries and becoming enshrined as international conventions. The persecution, deportation and displacement of Rohingya Muslims stems from the worst facets of human behaviour and are being stoked by hostility, intolerance and bigotry. For this minority community, the situation has resulted in abuse, torture and murder taking place on an unprecedented scale. More than 120,000 Rohingya Muslims are currently being forced to leave their homes, fleeing to escape the ongoing injustice, oppression and genocide. They are in a position where they are having to choose between death and exile. Even when choosing to flee they face grave hardships and dangers, being required to leave dead relatives murdered at the borders of the countries where they are desperate to find sanctuary. The screaming of the children, the wailing of the injured and the weeping of those who are running for their lives should be a clarion call for us all to act now. Our fundamental human values should compel us to do what we can to help refugee families and to provide them with as much financial and emotional support as possible. We must ensure that these most vulnerable of people are able to live a decent and dignified life until the conflict is settled and until we have reasserted the notion that a majority should never be allowed to persecute a minority. 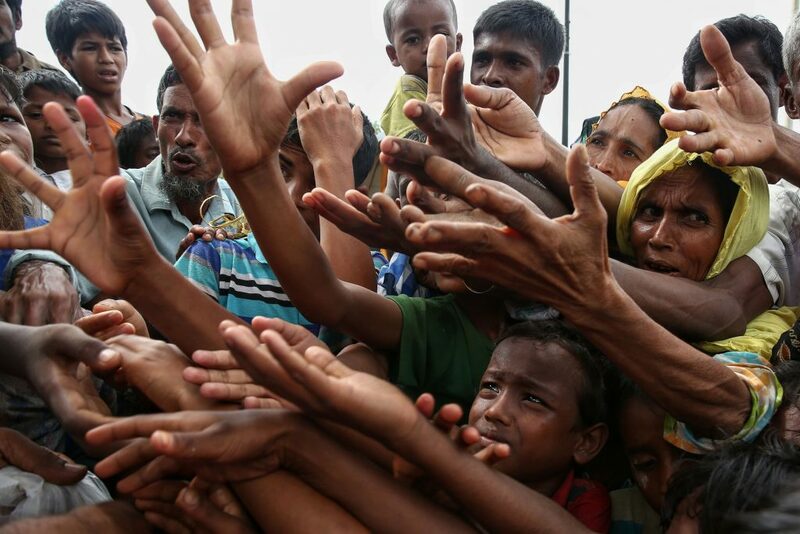 What is happening in Myanmar should not just concern human rights organisations and humanitarian organisations, but go beyond them to the level of priority on the agenda of world leaders. History will preserve for posterity our position on the genocide of Rohingya Muslims, which is a humanitarian disaster and one with potentially serious consequences for Myanmar and its surrounding countries. If not addressed, there is a very real danger that this issue will have profound negative implications for the protection of minorities elsewhere and will result in extremists exploiting it to promote fanaticism, hatred, violence and terrorism around the world. To address possible solutions to what is happening we must first help and support these Rohingya Muslim refugees whose lives are under threat and distress. Following that, we must pressure the government of Myanmar to ensure the protection of Muslim minorities and to end the conflict through the enactment of laws that ensure the concept of coexistence and respect for others, irrespective of differences. What the Rohingya Muslims are going through is an embodiment of the ugliest form of intolerance in the world. It is a true test to the role of organisations and individuals working in the field of human rights and international refugee protection. To prevent it escalating into a global issue, we must pull together as one family to fight the intolerance, hatred and abuse that is taking place. We must be faithful to our humanity and strive to promulgate the message of love, peace and respect through our actions. As United Nations High Commissioner for Refugees (UNHCR) Eminent Advocate for Refugee Children, I call on all leaders from around the world to fulfil their humanitarian duties and responsibilities towards the Rohingya Muslims. I ask that they advocate their cause as a minority group that suffers persecution and displacement and which is deserving of our fullest assistance to ensure that they are able to live their lives in safety, security and peace.